Fourth-year Grace Penders takes home the gold in the triple jump. 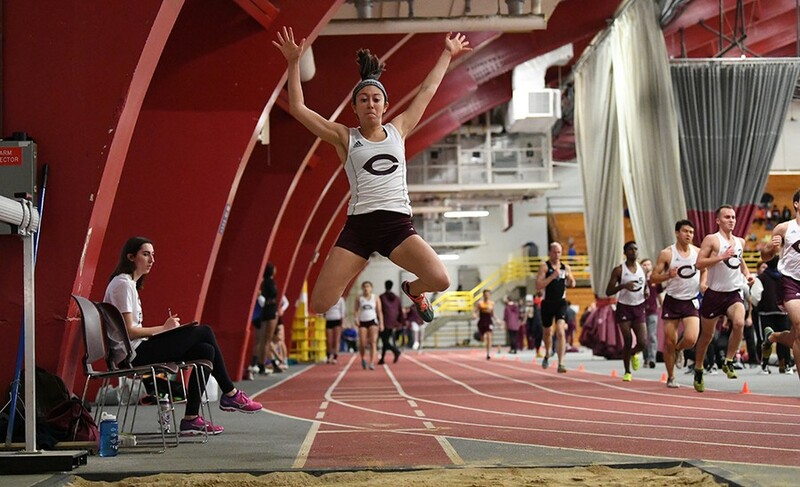 This weekend, UChicago’s track and field teams will compete at Illinois Wesleyan University’s annual I-55 Triangular meet. Following last week’s impressive victory at the Phoenix Invitational meet, the Maroons are ready to take on their second meet. Competition amps up with this weekend’s meet; Wash U and Illinois Wesleyan present formidable challenges for the teams. The teams will get a preview of what their competition has to offer for the season and where their runners stand in this early meet. The Maroons’ months of training paid off in scores last weekend. The women’s team scored 309 points while the men’s team scored 290 points. Both teams beat their competition by a giant margin. Experienced and new members alike debuted the season with impressive feats. Fourth-year Owen Melia’s 800-meter first place (1:59.17) was complimented by first-year Dillon O’Loughlin’s 400-meter first place (51.29). From the women’s team, a slew of upperclassmen debuted with first-place wins in the 200-meter, 5,000-meter, 1,600-meter, and 3,000-meter races. Two first-year members debuted their season with first-place victories: Kaitlyn Van Baalen with her 800-meter race (2:21.83) and Meg Fitzpatrick with her 400-meter race (1:00.72). Wins were paramount across the sprinting, throwing, and distance teams. Although it’s early in their season, the Maroons expect great things from their distance, sprinter, jumping, and throwing teams. In combination with the formidable presence of the veteran team members, the first-years hit the ball running with stellar performances in practice and at their first meet. The victorious and competitive atmosphere of the Maroons’ training and first meet of the season has led to their zealous energy for this upcoming meet. The Maroons will compete in Bloomington, IL at 11 a.m. on Saturday.